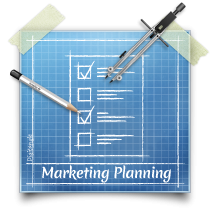 The marketing mix is a framework that anyone familiar with marketing is aware of. But for those of you that aren’t familiar: the marketing mix is in reference to “the 4Ps” of marketing: product, place, price, and promotion. This framework is useful in developing overall brands, products, and services. In light of a more service-oriented economy, marketers apply an extended version of the marketing mix: the 7Ps of marketing. The additional Ps refer to people, process, and physical evidence. These additional Ps focus on helping brands deliver a superior customer experience. Customer needs are changing at every moment. A lot of the marketing experience has gone in the way of digital, but more recently, more mobile. Mobile products and services make servicing the customer more accessible and instantaneous. Customers can order plane tickets anywhere without requiring access to a computer or even a phone call. They can simply get on the Internet with his or her phone and effortlessly order a ticket within minutes. Creating such a service is no different from the traditional marketing mix. 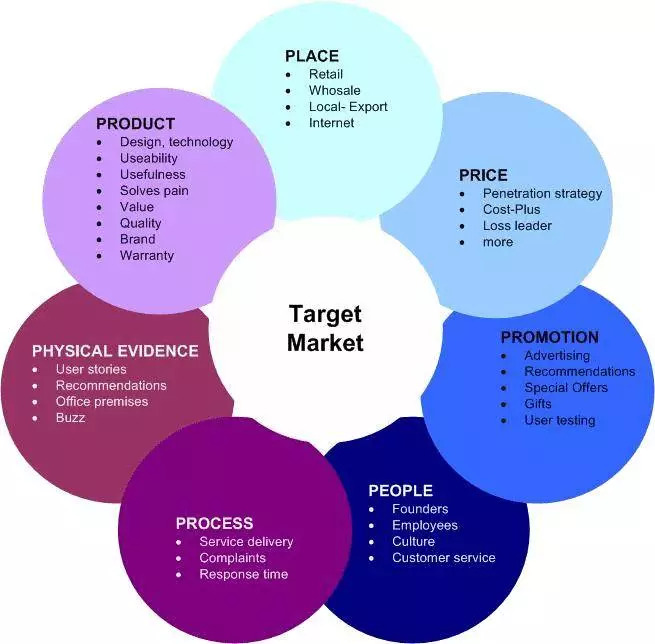 However, it requires more detailed customer targeting and service delivery in order to deliver a great customer experience they customers are mobile. To illustrate how the extended marketing mix can apply for mobile marketing, let’s consider an example from British Airways. 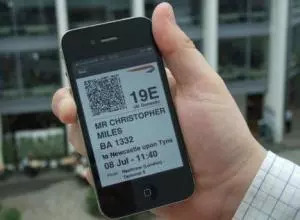 Several years ago, British Airways created a mobile application for its Executive Club Program. The program allows airline customers to collect frequent flyer miles, make reservations, and manage flight schedules much more easier. It’s available on the Apple App Store, Google Play Store, Windows Phone, and Blackberry App World. 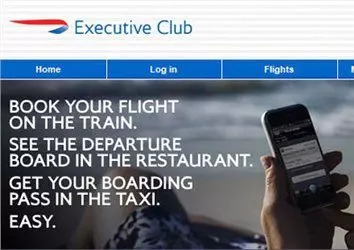 The British Airways Executive Club mobile application is a great example of the extended marketing mix because it was a service that was introduced into the world when mobile technology (and hence mobile marketing) really began to take off. Looking several years back at this case study allows us to see the brand’s approach to an extended marketing mix more clearly with greater hindsight. Extend the Executive Club experience with a mobile application and allow members to track their miles, reservations, and flight information on the go. It’s free for Executive Club members. The airline provided its application on its website and across mobile application stores. 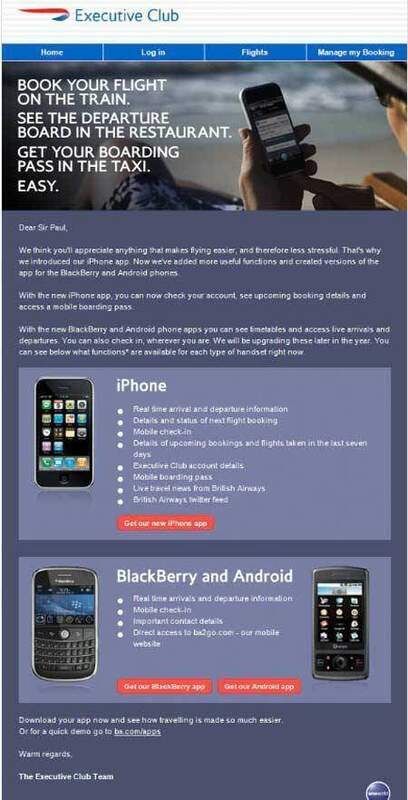 British Airways realized that a significant percentage of its e-mail subscribers open mailings with a mobile device. The airline decided to focus its marketing campaign on mobile-focused emailing promotions. In addition, it segmented the campaign down to four mobile platforms: iPhones, Androids, BlackBerrys, and desktop computers making it easy for people to download the right application for the right mobile device. Mail recipients were provided e-mails that tailored to the device they were using. The mobile application itself is acting as that “extra person” in your company. This extra person is there along side with the club member ready to answer his or her questions at any time. What time is boarding? Which gate should I go to? Did I remember to bring my boarding ticket? The application is there on standby ready to answer. The application is easy to use and allows users to access any needed information (such as flight itinerary) at anytime. Its main form of physical evidence comes from reviews. It has received nearly 4,000 application user reviews so far. The mobile application received over 250,000 downloads shortly after its launch. A large contribution came from its e-mailing campaign that achieved the following results: mobile e-mail open rate of over 50%and a click-through rate of 25%. Today, the British Airline Executive Club mobile application is considered to be one of the top ten airline applications. Let’s talk about applying and measuring product and process from the 7Ps. Again, we’ll use a mobile application as an example: companies need to make sure they are sending out something useful and simple to customers. If you are considering making your own company mobile application, consider looking at tools like PhoneGap or working with a marketing agency that has deep experience in creating mobile applications. Reviews, reviews, and reviews – understand what the customers think about the application overall and exactly why they like it or hate it. Reviews will give you a general indicator on what you’re doing right and what you can do better. Make sure you implement new versions that will address product or service short comings and include what people want in the application – this is a collaboration between those making the application itself and the product owner of the application. We’re talking about the people working on the application in addition to product and process here. Your first sets of happy customers are critical. They will help you win more customers or deter customers with physical evidence (i.e., reviews and ratings). Side note: you can measure physical evidence in many different ways. Mobile applications have a convenient way for people to find physical evidence through application store ratings. However, if you are doing something else, consider including material like case studies and customer stories on your website. You can measure by the number of people viewing or downloading such documents with Google Analytics. Applying concepts from the 7Ps of marketing is a great way to structure and analyze what you are trying to create and deliver to customers. It can be used to think at a very high level as much as it can be used to analyze results in great details. All of this may sound daunting, but working with others will help guide you through. Are you a Penguin, Panda, Hummingbird, or something else?